Linda’s Yoga Journey was conceived in March 2005 and passed into the bardo — temporarily — in February 2011. LYJ started out as my online journal to chronicle my first (and at the time I thought my last) trip to India to study at the Krishnamacharya Yoga Mandiram. I billed LYJ as being about my “cathartic rants and musings” but it became much more. LYJ was one of the first yoga blogs to critically question and comment on the status quo of modern American yoga. I like to think that LYJ was one of the first yoga blogs to provoke thought and shine a critical light on yoga in OMerika. It does this yoga crone’s heart good to see that people are still reading some of what I consider my most important and best posts. I want to thank those who sent me such heart-warming messages of support when I ended LYJ. The messages I read about how my writing inspired your practices was truly overwhelming and I bow to all of you. My decision to stop blogging came to me during my fifth trip to India for reasons that are explained here. But the fact of the matter is that I have matured — some might call it an evolution, I call it a shift — and moved on. There comes a point in all spiritual practice where the talking lessens and the lessons truly begin. You become more aligned with your True Self. I have always written about how yoga cooks us and my cooking is almost done. Or else maybe I am on a long simmer for the rest of my life with the occasional explosions that blow the lid off the pot. In any event, I have carmelized into a new and different dish. I continue to teach but only to specific groups and I let people find me. I’ve grown tired of pimping myself which seems to have become the way of the modern day yoga teacher. There is neither good nor bad in that, it just is. My teaching is that of a medicine woman. I give what is needed to heal. Sometimes it is bitter and sometimes sweet just like this blog is. I dose intuitively as any good medicine woman does. I am open to the source of healing and “I flow as I am directed,” as a wise sage once said. I take teachers you’ve never heard of as my inspiration. Stop being blinded by the rock stars and open your eyes to the person next to you — he or she may end up being your root guru. I decided to separate from the herd and I am walking with what I know to be true. And how do I know what is true? By intuition, by scanning my body, and feeling what is arising there. I have shed my skin. 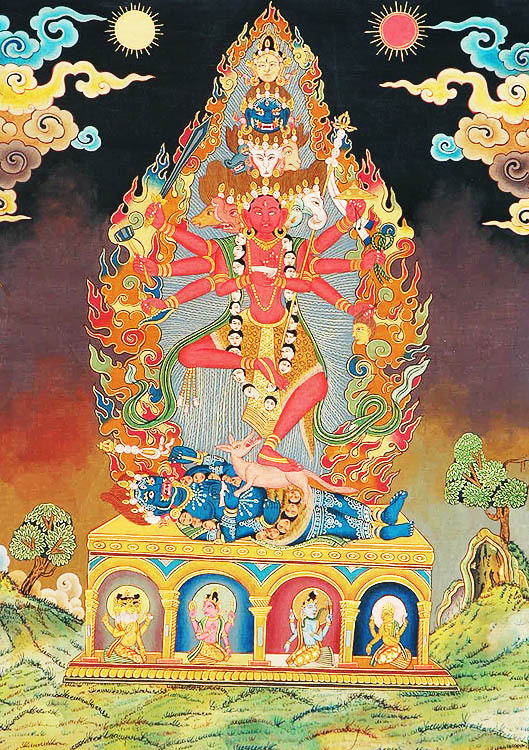 However, I decided to write again because I heard from so many readers earlier this year who told me there was a definite need for a yoga voice like mine — bold, unapologetic, and fierce, just like the above photo of the Buddhist version of Kali. So here I am in a new blogging platform, moving from Blogger to WordPress. I reopened LYJ for special topics only. I won’t be writing about yoga celebrities, celebrities who do yoga, or about trying to attain a difficult asana — plenty of other yoga bloggers already write about those topics. For those of you who are brand new readers, please start at the beginning of the archives and read about the journey….but fasten your seat belts, it’s a bumpy ride.